I can’t begin to tell you how much I’m looking forward to my four night extravaganza to Pigeon Forge, TN as the girlfriend and I will be staying in a cabin near the city. Thanks to a suggestion from someone I work with, we decided to go ahead and rent a cabin through YourCabin.com This is an organization that takes over someones cabin and rents it out to people. I’m not telling you which we chose, but it sure will be relaxing. 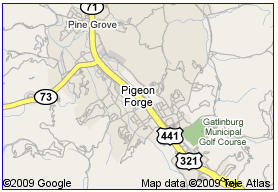 I’ve been to the Pigeon Forge area once a number of years ago. I remember telling my dad about the clouds in the sky only to hear him tell me they were mountains. The Smokey Mountains to be exact. The strip of road through Pigeon Forge was clogged with traffic but I entertained myself by looking at all the places where I could spend my pops money. We’ll be an hour or so north of Gatlinburg which we plan on visiting while we’re down there. If you have visited the area and could provide some suggestions on places to see or visit, please chime in with a comment. I’m aiming for a visit to Smokey Mountain National Park as well as checking out the big aquarium place.